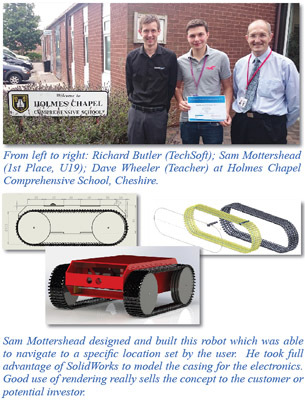 So, with a reverberating drum roll, TechSoft are delighted to announce that the overall SOLIDWORKS winner in the Under 19 competition 2015 was Sam Mottershead of Holmes Chapel Comprehensive in Cheshire. His design was a robotic delivery product that impressed all the judges so much, that even they would like to buy one! His use of Photoview, combined with engineering specifications, displayed a clear understanding of the mechanical and graphical talents needed to succeed in any design and engineering related field. Sam displayed skills normally reserved for undergraduate years! Entries to the Under 17 competition were also just as impressive, the overall winner being judged as Georgia Thomson from Alec Hunter Academy in Essex. Her detailed cross sectional designs, complete with 3D graphical photoview and detailed zoom-ins gave everything that a designer, or engineer, would need to know when building the product. No prizes here, but special mentions go to the following Highly Commended Under 19 student entries. Dhillion Parajiea from Ricards Lodge High School in London whose lifting device showed meticulous planning, and detailed exploded diagrams using SOLIDWORKS; Nikita Stepanov of Bromsgrove School in Worcestershire whose desk assembly impressed; Milton Lau of Bromsgrove School whose concept car explored the flow analysis features of SOLIDWORKS. 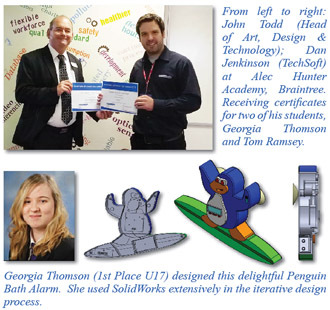 Harrison Hill and Rebecca Woodward-Smith, again of Bromsgrove, explored how SOLIDWORKS can be used in architectural design with two technically clear designs. Finally, Xavier Tang from Queen Mary’s Grammar School in Walsall showed off the material render capabilities with his ‘Letterbox’ project. And just before you stop putting your hands together, more shout outs to the Highly Commended Under 17 entries; Thomas Ramsey from Alec Hunter Academy showed ingenious technical detail and advanced assembly skills with his ‘snorkel bath alarm’. David Pearce of Queen Mary’s Grammar designed an advanced desk assembly, and Usaamah Ahmed kept Queen Mary’s riding high with an innovative medicine cabinet, while John Lennon of Maghull High School in Merseyside again demonstrated the flow dynamics of SOLIDWORKS. SOLIDWORKS has been adopted across the education spectrum and the ‘norm’ for commercial design is now becoming a mainstay of schools. The iterative design process is encouraged by SOLIDWORKS ability to stress test a part, go back and edit a part, output to a 3D printer or milling machine for rapid prototyping, and then back to 3D modelling again. All of the students displayed the full range of SOLIDWORKS’ features, which not only puts UK schools at the forefront of design and engineering education, but also gives them an advantage in succeeding in an industry that has driven over £70bn into the UK economy. Congratulations to all of the winners, and especially the hard work and dedication of the teachers, and technicians involved. We are proud that you are keeping the Design & Technology flag flying so high.